In 10&apos;s or more: pass,set, pass, follow. 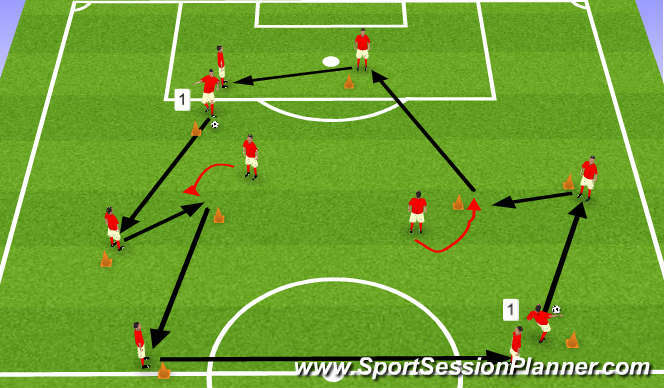 Focusing on the quality and pace of the pass and the timing and arced run from the midfielder who receives the set pass.Ball starts with players 1.Each player must follow pass. ensure crosses and shots from both sides. The exercise is initiated with a pass (1) to player (A) who is checking to the ball. 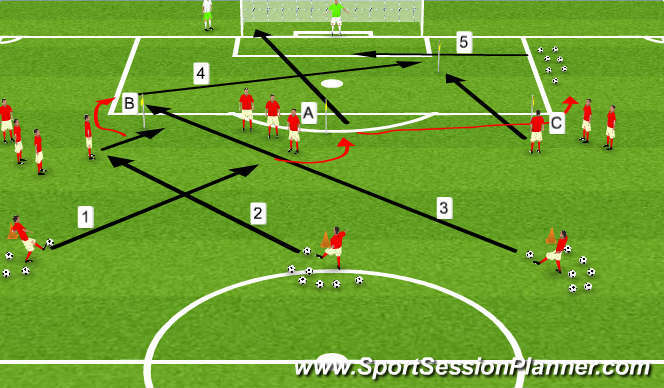 Player (A) must spin and strike a shot at goal before immediately sprinting around flag at group (C). Pass (2) is played to player (B) who spins inside the flag to create an angle for a shot quick shot on goal. Player (B) immediately spins back out around the flag to receive a diagonal driven ball (3) from server. Player (B) must control this ball quickly before driving a ball (4) along the ground towards the back post space for player (C). Players (B) and (C) must stay active in the box to time their runs for a cross (5) from player (A). Players on the outside are feeders and have two touch max. If score from volley or header then 2 goals Winner stays on!